They are all fun memes to participate in...I hope you can join in with the fun and check out some of the participating posts. It's a new day and a new week, start off fresh to accomplish your best! Happy Monday, everyone! 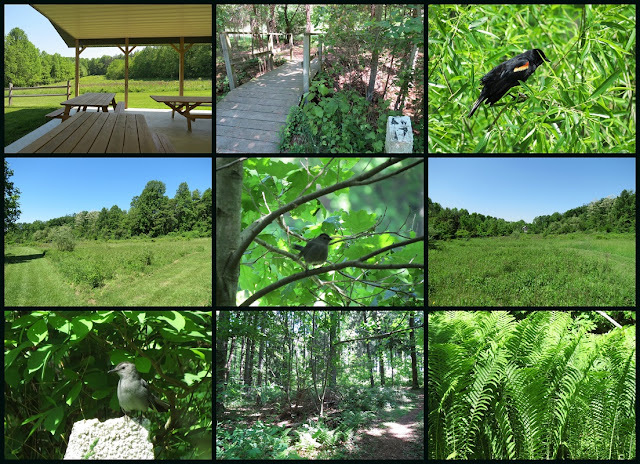 Hubby and I decided to visit a new local park nearby for our walk and to do some birding. The Pine Valley Park is adjacent to the Charlotte's Quest Nature Center. 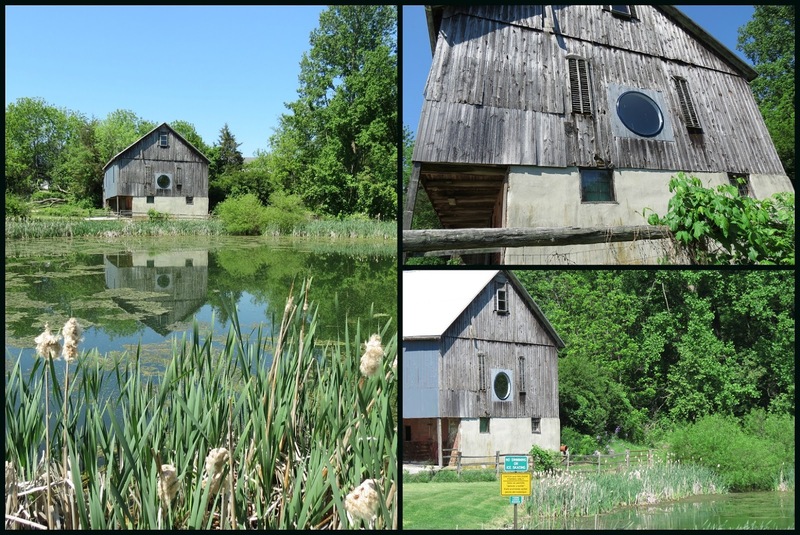 The nature center is located on 60 acres, has a pond, stream and wildlife and has 4 1/2 miles of hiking trails. 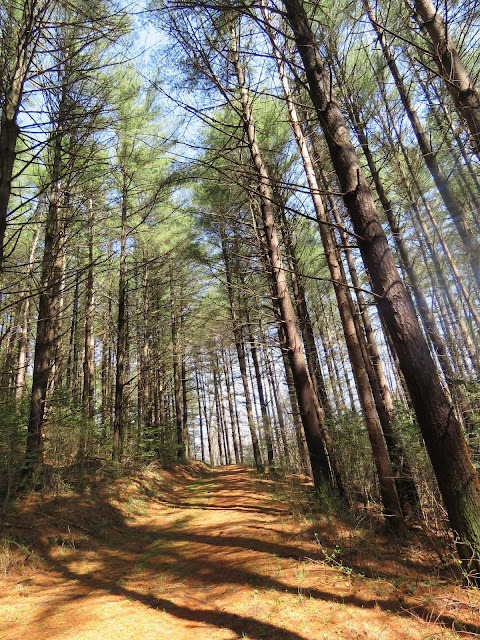 The trails consists of fields, and a wooded area with the Pine trees and hardwood forest. Above the parks picnic area, bridge and trail, Redwing blackbird, trail near field, catbirds, hardwood forest and ferns. 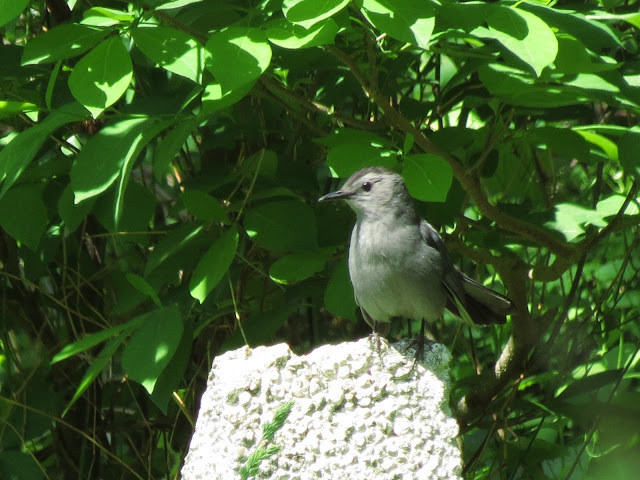 The Gray Catbird was a common bird seen that day along with the Redwing Blackbirds. Other birds were heard more than seen like the Ovenbird, Wood Thrush and the American Robins. For my NF Tree entry a view of the pine and hardwood trees seen at the park. 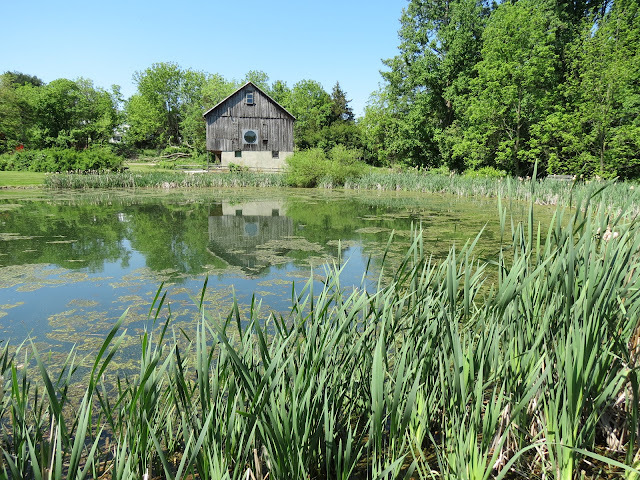 A view of the pond and barn, a Redwing Blackbird and some colorful weeds. I do not think the barn is part of the park property but it is adjacent to the property and pond. There is a trail around the pond with benches. I really liked the reflection of the barn. I like the round window on this barn and the reflection of the barn in the pond. I hope you enjoyed our walk and the images. Also, thank you for stopping by and for the nice comments. Have a great day and new week ahead. and Our World Tuesday and NF Trees and Bushes. Thanks to Judith our host of Mosaic Monday and to Mersad of Through My Lens and the hosting group of Our World Tuesday: Arija, Gattina, Lady Fi, Sylvia, Sandy and Jennifer and to Monica for hosting NF Trees. 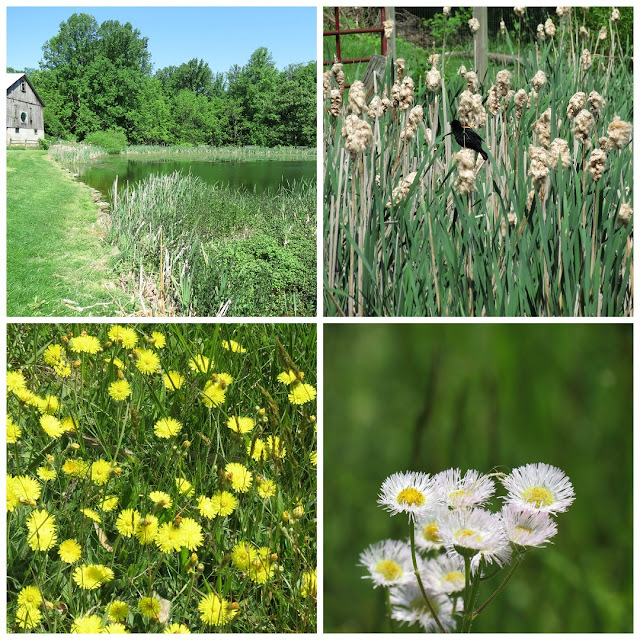 Thank you for sharing another lovely nature center Eileen. From your photos it looks gorgeous! Super photos, all of them. Wonderful grey catbird portrait, Eileen! Great bird and flower pics, and nice reflection of the barn! fabulous photos of all this green things and the blossom and landscape. The lake is so serene. Amazing ! What a great barn--I've always loved weathered barns. Looks like you two found another great spot for a hike and some birding. I've never seen an ovenbird and so I looked them up--and the calls--I have heard. Neat! Great shots of the countryside. Wonderful sights, really. If you like you can link up with the "Through My Lens" meme as well. Link is below. Have a happy and wonderful week! Very nice pictures. A wonderful place to be. Good shot of that bird. Nice pictures and lovely place.. Regards. Wonderful, wonderful photos and mosaics, Eileen! So much beauty and greenery. I do so enjoy your nature walks. Thank you! I, too, like the barn reflecting in the pond. It must have been a glorious day! Wishing you another one today! Beautiful images, especially the houses, fantastic. Sweet little Catbird, taking shelter in his little cave of foliage! I love your barn photo with the reflection captured so well in the sun! Another set of wonderful photos Eileen, a joy to behold. A glorious visit. Have fun. Eileen I just love this " It's a new day and a new week, start off fresh to accomplish your best! Happy Monday, everyone!" Brilliant ... and may you have a lovely week. Lovely selection of photo's here I especially like the Gray Catbird and the one of the pond and barn - that to me has a lovely feel about it. Love that pond and the redwing blackbird. I used to see them all the time when I lived on Galveston Island... don't see them in the big city. You have the most marvelous places to walk! Happy Monday! A great park to visit. You have a lovely collection birds, scenery and lake with the barn. Love the catbird pic...Fabulous barn photos..Looks like a great Nature center.. Wonderful mosaics, Eileen....such rich greens, and love that little bird peeking out. All the the green is so beautiful!. These photos make gorgeous mosaics. What a lovely nature centre to visit. Seeing a round window in a barn is unusual, and a lovely touch. That is a lovely barn, the round window is quite distinctive. Beautiful place with such lovely birds. Your mosaics are so pretty Eileen, and I too like the round window on the barn! What a wonderful Nature Center, Eileen! Love your photos of it all, but particularly love the barn reflected in the pond. That round window is so unusual! Oh Eileen what a beautiful visit. It seems our birds will be leaving soon and coming to you! Those views with the barn are just stunning! You have some amazing trails for the wild life enthusiasts to enjoy in the States - well kept and maintained also. I always love reading about the birds you see on these walks Eileen! I am intrigued by the fact that this is a new park as it looks quite well established. Beautiful reflection of the barn. Ah, I do love the Catbird, Eileen, and of course, all your captures are superb and delightful and a bright spot in my morning -- any morning!! Have a great new week!! Very nice series. I love the photos of the pond !! What a beautiful park for a walk! Beautiful nature and so many kinds of preety birds! Great captures!I like the old barn and the reflection in the water! Thank you for sharing!Have a happy week! I enjoyed all of those different shades of green in the first post. Another amazing nature walk, beautiful spot. Great photos and I am sure that it must be a very enjoyable place for a walk. The reflections in the pond are especially beautiful. Thanks for sharing. I really like the barn and pond. Lovely reflection too. Everything looks cool and peaceful, nice place to wonder around in. The reflection of the barn you captured is really nice Eileen, a round window is unusual isn't it? So much green. I feel a healing. I especially love the pond shot. Pretty place! I love that barn. You captures some nice shots during your walk. I especially liked the barn shot by the water! Gorgeous, Eileen! I especially love the barn photos! So lush and lovely! And what a gorgeous barn with the round window. I love the birds and flowers and all the shades of green in your photos, Eileen. Everything looks so lush and healthy there! That barn looks like a great fishing base! Så många fina bilder från parken. Där kan man hitta massor av fina träd och buskar bland alla blommorna. Thanks for linking up at NF Trees n Bushes. Of course, I always enjoy your images/mosaics. As always. And enjoyed this adventure in the new park you two visited. Greta fun to visit new areas, and finding new things to photograph-. I like the barn very much. It looks a lovely green park. The barn reflection is very picturesque. Wonderful collages Eileen. Each capture is beautiful! Wow...what a beautiful place! You could have just dropped me off and I would have stayed! Awesome photos! Gostei mais da segunda foto, o pássaro até faz pose para a foto. Lovely pictures as always Eileen. what a lovely park. the barn looks wonderful and your nature photos are gorgeous as always. have a greatt day Eileen. Olá Eileen, que belo lugar! Também gostei muito do reflexo do celeiro no lago. Wait'll you see my bird photos, Eileen! I can't upload them now, but I will next week! They are so joyful. Enjoying every shots, Eileen. The park is a great place to visit. Looks like a good place for a nature walk. Thanks for sharing. What a lovely park to have nearby, and perfect for you and your birding. I would just enjoy the tranquility - and like you, I love that old barn and your shot of it framed by nature and reflected in the pond. Now this is a place to visit and capture the best photos ever! What a remarkable view! Your mosaics are always nice. Thanks for sharing. Have a great week! Do you see me way down here at the bottom. Your countryside looks so lovely and rural and quaint and classic. We don't have the catbird here, handsome fellow.